Dr. Leonard Fitts, Interim Superintendent (left), Paul Draper, Senior Class Representative, and (right) J. Neil Campbell, Board of School Directors’ President, sign the banner Monday night. CALN — To say it’s been a stormy period for the Coatesville Area School District might be an understatement. But parents, staff and administrators came together this week to signal that they still had pride in the district, its staff, teachers and students — and did so in a very visible way. 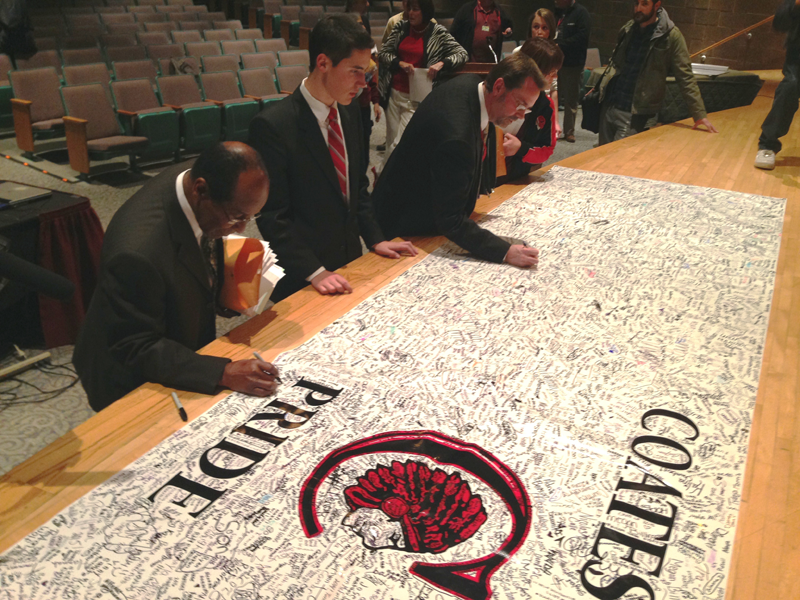 Hundreds of students, parents and staff members signed a giant “Coatesville Pride” banner — most publicly during Monday night’s Board of Education meeting to signal their continued support for the district and its students. The banner will be rotated to all of the district’s schools — a daily reminder to students and staff that the community still supports them. The idea came into being when parents, community members and staff members met in October to look for projects to improve morale across the district A parent, Erin Schivert, suggested creating a banner for the last home football game that everyone who attended could sign in good faith, representing the CASD community. What started as an idea for a one-night event, ballooned as more people became interested in supporting the project. After discussions with Rob Fisher, high school principal, the district was able to purchase a 20’ x 6’ durable banner that would ultimately circulate throughout all the schools in the district. 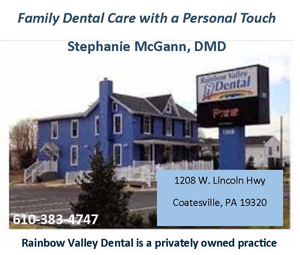 The banner would read: “COATESVILLE — PRIDE” with the Coatesville logo in the center. Each school received enough black Sharpies so that every staff member, students, and community member would be able to sign the banner. A schedule of when the banner would be in each building during the month of November was made up, and shared with the community at large using school websites, NTI messages from each individual school and it was announced during the Board of Education meeting on Nov. 12. The final step in the process took place Monday night when the banner was presented to the Board of Education — where board members and administration leadership publicly signed the banner. The banner will now be hung in each school on a rotation — for all students, staff and community members to see, as a reminder of the pride that remains within the district. And this would reduce the hurt to specific individuals and cure the ills of the Como Administration and cronyism how?